Wendy Kesselman’s 1997 adaptation of the original 1955 Pulitzer Prize-winning script by Albert Hackett & Frances Goodrich, brings colour to the character of Anne, until she dances into the audiences’ hearts. The play is skillfully directed by Jillian Keiley as an ensemble piece. No one character stands out- a great way to reinforce the idea that all eight actors, hiding in the attic in Amsterdam, are in the same boat. The differences they may have had before they hid from the Nazis have been erased. They’ve all got yellow stars on their shirts and they share the same fate. In the time-suspended world of the hiding place- class, gender, age, vocational and cultural differences have vanished. They are united in their common fear and desperation. Keiley’s use of a chorus, that alternately reads sections from Anne’s diary, underlines the characters’ alienation. The world outside has gone mad- Nazis’ chanting invades the sanctuary driving the Franks and their friends deeper into their cocoon. Farb’s passion, humour and energy brings the character of Anne vibrantly to life. Her spirit brightens the darkest shadows and made the audience smile as she stared at the moon through the cracks in the wooden slats. Andre Morin, also puts in a dynamic performance as teenager, ‘Peter van Daan’. Morin begins the play in a state of shock and emotional withdrawal. But as he spends more time with Anne, he becomes more animated. His character arch was clear and believable. The budding romance between the two teenagers was the emotional heart of the play. Joseph Ziegler, also puts in a heartwarming performance as Anne’s father—the peacemaker among fighting factions. Bretta Gerecke’s set- consisting of a gigantic wooden structure on three sides, resembling the inside of a box car- serves as premonition of the family’s fateful train trip to the death camps. Sound designer, Don Ellis, did a great job of establishing hysteria with frequent train whistles, frightening radio broadcasts about shipments of Jews to the east; soldiers marching; and screaming. The danger from outside the walls seemed palpable. 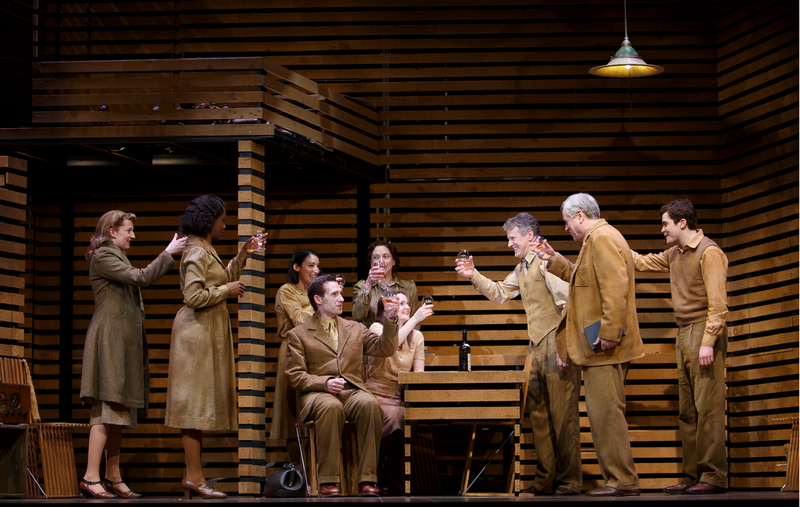 At the end of the play, Ziegler once again stepped outside the world of the play to talk about what happened to the other seven who shared the attic with him. As the sole survivor, he published Anne’s diary in 1947. This production is a must see. It’s extremely well directed and acted—and it sends an uplifting message about the transcendent quality of the human spirit. The Diary of Anne Frank is playing at Stratford’s Avon Theatre until October 10th.